Narrator: Time has run out for man. Our hold on the planet is over. Welcome to Earth. Population: zero. Impressive visuals, but this is as much science fiction as science fact - the level of speculation that goes on mars it. It routinely ignores non-degradable garbage and nuclear waste in its prognostication, there are huge leaps in logic - for instance, involving zoo animals. 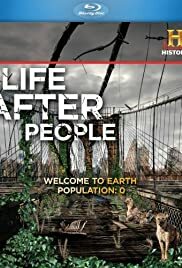 They present the only issue as whether they can get out of the zoos, not if they can actually survive the wild, they will actually mate, if there is enough diversity to even create a gene pool for the species to survive. In essence, this show takes incredibly complicated issues with multiple factors and boils them all down to more simple ones. Plus, they misrepresented an area of Chernobyl in order to make their point! There was something vaguely Republican about the whole thing, the idea that no matter what we do to the Earth, it's okay, because it's going to turn back into a pristine Garden of Eden anyhow! Enjoy this for what it is - a science fiction documentary.